Teaming up with our clients through their challenging (though certainly life changing) journey of weight loss allows us to make some very interesting and intriguing distinctions. There are definite differences among individuals who inquire or enroll in the Lifetime Metabolic Program. Some factors are clinical related. Some are more lifestyle oriented. And, in our science based approach we even dig into significant genetic factors that vary and help determine strategies and results. Perhaps the biggest difference maker, though, which lies at the foundation of all those things is the mind-set and perspective of people … even their self-talk about their weight and health situation … and what they will do about it. Often times it simply comes down to two words ... and one’s application of them in their situation or even their life in general. Those two words are reasons and excuses. When we meet and interview a person to establish if they may be a good candidate for our program we must determine this: Is this person in the healthy mode of pursuing a reason to make a change? Or are they making excuses why it can’t or doesn’t happen in their case? Have you ever stopped and thought about this? You have probably heard people in both modes? Maybe just pointing this difference out has allowed you to quickly establish where YOU are? “Reasons” for effective and lasting weight loss vary greatly. They are often tied to things like a concerning medical diagnosis, the inability to do something one loves to do, the desire to be able play with grandchildren, a realization associated with the loss of a family member or friend, or merely a final threshold hit in the way a person feels physically or emotionally about their body and level of health (or lack thereof). All of these are good reasons to do whatever it takes to make life improving changes. 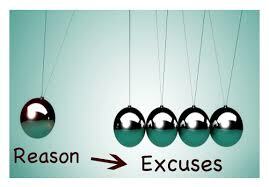 Unfortunately, the list of “excuses” that lead to failure in making that type of weight and life change is often a much longer list. In fact, the idea of listing them here may prove counter-productive. We don’t want to even acknowledge or give any attention to those common excuses. You likely know them already. So, let’s move on! Reasons get respect. Excuses are shamed. Excuses are dishonest. Reasons have nothing to hide. Excuses keep us from the real issues. Reasons are the real issues. Reasons grow from virtues. Excuses grow from vices. Excuses retreat from action. Reasons put us on the front lines. Reasons say no to lesser things so they can say yes to better things. Excuses say no to better things because they’re too afraid to give up lesser things. Reasons dispel darkness. Excuses let darkness reign. Reasons create clarity. Excuses stir up the mud. Reasons improve morale. Excuses destroy it. Reasons change the world. Excuses never change anything. Excuses murder and bury reasons in the sand. Reasons can return the favor … if we let them. Wow! That is a powerful comparative list no matter what you apply it to: our work life, relationships, our spiritual life, and certainly our health, fitness and you guessed it: weight loss! So, today we ask you this: where are you living right now? In WHY-land … or in EXCUSE-ville? If you are in a mode of “reasons to” do it now like never before? Then, the Lifetime Metabolic Program may very well be the exact HOW that you need to achieve your WHY! If you’re stuck in “Excuse-ville”, we probably don’t need to tell you that’s a dangerous and uncomfortable place to live. The good news is this: most of those WHY NOTS have already been heard, tackled and overcame with the Lifetime Metabolic Program. The Lifetime clients you see pictures of or read about or listen to (and all others who have shed fat and kept it off) were focused on the REASONS WHY to do it first! They shed excuses before they ever shed a pound of fat! We’ve seen it over and over. If we can help develop a big enough WHY for you, the HOW is indeed in place! Our final phrase for this week comes from a legendary author, speaker and personal development guru by the name of Jim Rohn who repeatedly taught “If you really want to do something, you’ll find a way; If you don’t you’ll find an excuse”. If you REALLY want to shift your weight and TAKE BACK CONTROL of your health once and for all, we invite you to contact us today! Don’t delay. Don’t allow the time of year, your busy-ness, the holidays or anything else become an excuse. You know why? Because after those things pass, there will be another batch of excuses waiting to be latched onto!